A sweet and feminine look is still your best bet when getting made up for your date tonight. Here, a makeup artist gives tips to achieve it. If you're reading this now because you still haven't decided what look you'll wear for your date or party tonight, then you're probably in last-minute-panic-stricken mode. Relax. Stress would show on your face. To help you figure out the date makeup look that would work (and achieve it without too much effort), Cosmo asked Christine Rojas-Lavina, a professional makeup artist from The Makeup Forum, to give you, ladies, some makeup tips for that much anticipated rendezvous. Christine says that for dates, it's best to “keep [your makeup] simple but pretty and sweet--you don't want your date to get distracted with your makeup. You want him to focus on you.” And she goes on to list easy-to-follow steps that would hopefully make him even more smitten with you. 1. Start with flawless skin. Don't pile on the foundation, just spot conceal if possible. The goal is to have an even complexion. A concealer with great coverage is your best friend. If you really must wear foundation, keep it light so you don’t end up with mask-like makeup. 2. Lightly apply a soft shimmery eyeshadow to brighten up your eyes. A silver shimmer eyeshadow is a nice choice. Take note, however, that shimmer eye color is different from the frosted one: The former is more forgiving than the latter. You don’t want your date to get "blinded" by the light-reflecting particles in frosted eyeshadow as he tries to look into your eyes! Apply eyeliner on your upper lids, as close to your lash line as possible, to make lashes appear fuller. Next, curl your lashes and swipe on mascara. You can forego lining your lower lash line to keep your look sweet, but don’t forget to put a very light coat of mascara on your lower lashes as well. Make sure there are no clumps! You want to emphasize, not exaggerate, your lashes. 3. Groom your eyebrows. Beautiful eyebrows work wonders, as most can get away with little or no makeup as long as their eyebrows are clean and perfectly shaped. Having it groomed by a professional may be wise (and worth the expense). Then just maintain them by plucking stray hair when they start growing. 4. A soft pink blush will give you a healthy, irresistible glow. 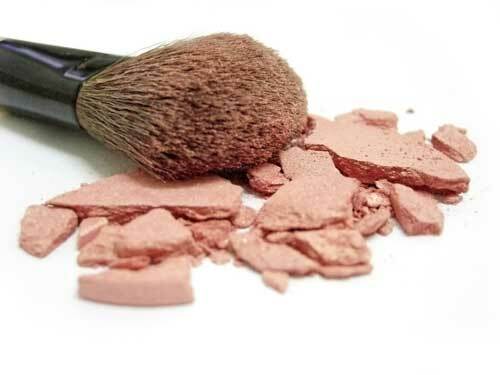 When applying blush, start with just a little, then gradually add more if needed. 5. A lipstick shade in the same color as your lips or, at most, slightly darker is your best bet. Top this with gloss to make your lips look fuller. Don’t go crazy with gloss, however, as you don’t want your pout to look “slippery." And, you would want to keep things less messy in case there's a makeout sesh right after. 6. To finish your look, VERY LIGHTLY dust shimmer powder on your cheeks, forehead, chin, and the bridge of your nose. However, skip this step if you have very oily skin. 7. Bring tissue and oil blotters in your date purse. Excuse yourself once in a while to visit the ladies’ room and touch up your makeup. Don't keep him waiting too long; blotting out oil build up should work just fine.